At about 9,500 years ago, the Holocene "Optimum" began setting in motion the warmest and wettest phase of climate during the Holocene. The Great Lakes expanded, and the southern Sahara became a Savannah as monsoon rains reached far to the north of their current extent. 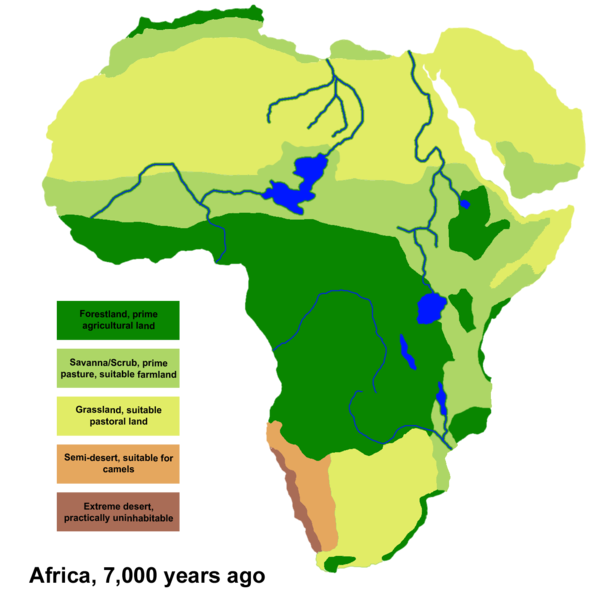 In the western Sahara, Niger tributaries stretched deep into the desert, and Lake "Mega-Chad" fed it through the Benue. Although after 7,000 years ago, a general cooling and drying began, the final drying of the Sahara only started about 4,500 years ago. While short-term variation has continued, current conditions were well established by about 2,000 years ago.